Staff Sgt. Mark R. de Alencar was born in a U.S. Army hospital in Nuremburg, Germany. Due to his father’s military service, he grew up in multiple locations, to include: Germany, San Antonio, Texas and Edgewood, MD. He graduated in 1998 from Joppatowne High School in Joppa, MD. SSG de Alencar joined the U.S. Army in July 2009. He attended Basic Combat Training and Canon Crewmember (13B) Advanced Individual Training (AIT) at Fort Sill, OK. His initial assignment was Bravo Battery, 2nd Battalion, 11th Field Artillery Regiment, 2nd Stryker Brigade Combat Team, 25th Infantry Division at Schofield Barracks, Hawaii. Shortly upon arrival at Schofield Barracks, he deployed as a rifleman in support of Operation Iraqi Freedom and Operation New Dawn. SSG de Alencar graduated from the Special Operations Qualification Course on September 2016. He earned the qualification as a Weapons Sergeant (18B) and was assigned to Bravo Company, 1st Battalion, 7th Special Forces Group (Airborne) located at Eglin AFB, FL. 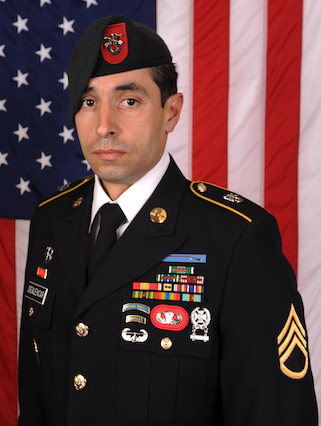 SSG de Alencar was killed in action on April 8, 2017 when he was struck by enemy small arms fire while conducting combat operations in support of Operation Freedom’s Sentinel in Nangarhar Province, Afghanistan. SSG de Alencar’s military education includes: Basic Leaders Course, Advanced Leaders Course, Jungle Operations Course, Ranger School, Airborne School, Air Assault School, Special Forces Qualification Course, Survival Evasion Resistance, and Escape School. His awards and decorations include the Purple Heart, Bronze Star Medal with V device, Army Commendation Medal with 5 OLC, Army Achievement Medal with 6 OLC, Meritorious Unit Citation, Army Good Conduct Medal with 2 OLC, National Defense Service Medal, Iraqi Campaign Medal with 2 Campaign Stars, Global War on Terrorism Service Medal, Non-Commissioned Officer Professional Development Ribbon with numeral 2, Army Service Ribbon, Overseas Service Ribbon with numeral 3, Combat Infantryman’s Badge, Expert Infantryman’s Badge, Special Forces Tab, Ranger Tab, Basic Parachutist Badge, Air Assault Badge and the Drivers Badge. SSG de Alencar is survived by his wife, Natasha, sons Rodrigo and Marcos, stepson Deshaun, daughter Tatiyana, and stepdaughter Octavia.